Perennials are treasured for their familiarity, as these plants seem to resurrect themselves year after year after a long cold winter. A crucial aspect of keeping perennials alive is giving them the proper amount of sunlight: not too much or too little. There are many perennials that produce their best foliage and flowers in partial or semi shade. Known also as angel wing's and elephant ears, caladium (Caladium bicolor) is a perennial foliage plant native to tropical South America. The plant reaches an average height of about 2 feet, producing broad, heart-shaped leaves that are either a variegated green and white or pink and green. The plant is ideal for a semi shady garden border. 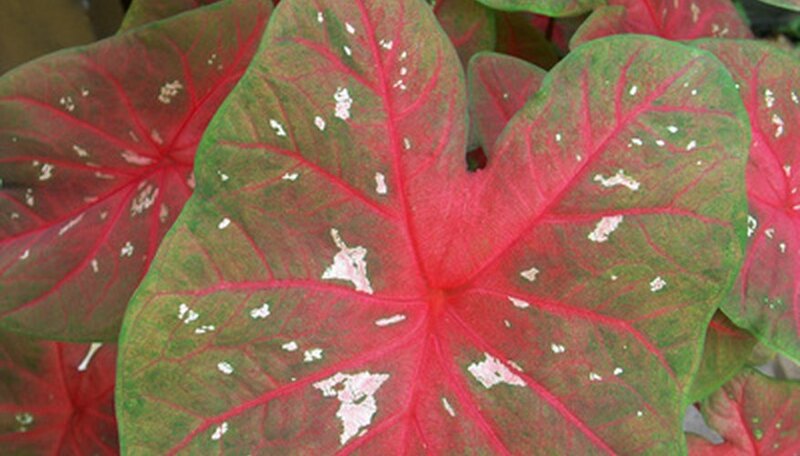 Caladium is a warm weather hog that does best in USDA zones 9 to 12. The plant prefers a humus-rich, well-draining soil that is a little bit acidic. Adding organic matter such as rotting leaves will help keep the plant looking healthy and fresh. Water frequently during the growing season, ideally two or three times a week. Japanese anemone (Anemone × hybrida) is a low maintenance garden hybrid notable for its showy, rose-like flowers, which are a delicate shade of pink or peach. The plant is good for late season color, as it continues to flower until well into fall. The plant grows to be between 1 to 3 feet tall and is popular as a specimen or border plant in cottage of woodland gardens. The plant does best in partial shade in USDA zones 5 to 8. Japanese anemone should be grown in a humus-rich soil that's kept consistently moist, but not wet, to the touch. The plant may become invasive in ideal growing conditions. A member of the jewel weed family, impatiens (Impatiens wallerana) is a flowering evergreen perennial native to tropical Africa. The plant has a shrub-like, mounding habit of about 2 feet, accented by dark green leaves and crisp looking flowers. Impatiens flowers in the summer, producing flowers that are pink, orange, lavender, white or even bi-colored. Impatiens is widely cultivated throughout USDA zones 4 to 10, although it will only grow as a perennial in areas that don't suffer hard winter freezes. Impatiens prefers a partial shade location with soil that is fertile and well draining. Water the plant frequently during the growing season, and pinch back dead flowers and foliage to keep the plant looking neat.